Graduate Student Workshop: Meet and Connect with the Presenters. This workshop is an excellent opportunity for Graduate Students presenting their work at GECCO (other workshops or streams) to receive higher-level feedback and networking opportunities. Students present research to a mentor panel and receive feedback about results, methodology, future direction, and presentation style. Students will also be invited present their work as a poster at the Tuesday evening Poster Session. An excellent opportunity to network with industry and academic members of the community. Submit 4-page paper describing your current research. Students hone their research presentation skills with two presentations: at the workshop to other students and mentors, and the Poster Session to active researchers. Submit a 4-page paper describing your senior research, summer, or exceptional course project. and to UCL for hosting the downloads. For participants looking for positions in academia or industry, and for employers looking to hire. 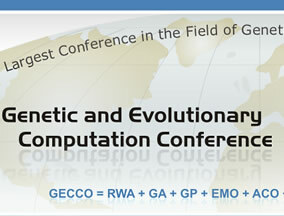 The Genetic and Evolutionary Computation Conference (GECCO-2008) will present the latest high-quality results in the growing field of genetic and evolutionary computation. 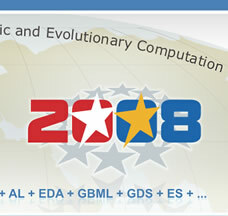 Topics include: genetic algorithms, genetic programming, evolution strategies, evolutionary programming, real-world applications, learning classifier systems and other genetics based machine learning, evolvable hardware, artificial life, adaptive behavior, ant colony optimization, swarm intelligence, biological applications, evolutionary robotics, coevolution, artificial immune systems, and more.